As a landlord, you probably want to know specific steps you can take to secure your rental property and protect residents from crime. Here are several options for you to consider. Although you can’t directly control the amount of crime in your rental property neighborhood, you can be proactive. A great way to take the initiative in fighting crime is to join or start a crime prevention program in your neighborhood or within your rental community. Check with your local police department and neighborhood association to see what programs are available in your area. One of the best crime prevention programs for rental property owners is available through most local law enforcement departments. The Crime Free Multi-Housing Program unites rental property owners, local law enforcement, and residents in an effort to fight crime and raise the local standard of living. Trainers certified with the nonprofit International Crime Free Association teach owners and managers how to help keep illegal activity out of their rental properties. After the training is complete and you demonstrate that you’re screening prospective residents, evicting problem ones, and using a Crime and Drug-Free Housing Addendum, your property can be certified as a Crime Free Multi-Housing Community. One of the best ways to keep crime from occurring at your rental property is to make security a top priority. Although you can’t guarantee that your property is safe, you should do what you can to increase the likelihood that residents don’t encounter problems. One of the best ways to secure your rental property is to screen applicants carefully. 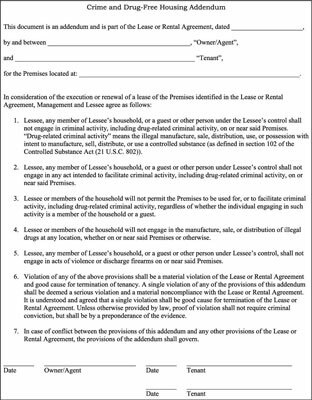 In addition to credit checks and references from previous landlords, criminal histories are especially important. Equip every standard, solid-core entry door for every unit with a locking doorknob and deadbolt (preferably with minimum 1-inch throws or even longer). Equip every sliding entry door with a security bar. Keep all the doors to the common areas of the building locked. Make sure all windows have latches that residents can use to lock windows from inside. Install peepholes in rental unit entry doors. In addition to keys and/or access-control systems, use standard security devices such as deadbolts and locking passage sets. All wood entry doors should be solid core and have wide-angle peepholes. Window locks and safety pins are valuable security devices. Make sure your resident initials on her move-in checklist that all security devices are operative and that she knows to contact you immediately if any locks or security devices are inoperative. Make sure that all common area building entries have a clearly marked street address and that all apartments have clearly marked apartment numbers on their doors. Effective outdoor lighting has many benefits to dissuading crime. Proper lighting can serve as a deterrent to vandalism and other crime while illuminating your building walkways and the common areas to help prevent risks to residents and guests. The right lighting plan can also beautify your building and improve your property’s curb appeal. Keep fixtures clean and clear. Replace any exterior lighting on clock timers with photocells that automatically detect darkness. Establish a regular schedule for inspecting the common area exterior lighting and immediately repair broken fixtures and replace any burned-out bulbs. Overgrown shrubs and other landscaping may provide hiding places for criminals and conceal criminal activity, so keep shrubs and other landscaping trimmed and restrict access to unused or dead spaces. Keep in touch with local law enforcement. Watch for signs of criminal activity. Inform residents of any criminal activity in the area and tell them what they can do to protect themselves. Fences and gates: To limit access to a large rental complex, you may want to fence in the property and install gates at all entrances, providing access only to residents and their guests. Security cameras: Security cameras deter crime and help identify suspects and gather evidence. They’re relatively unobtrusive for residents, but they can be costly to purchase and service, and monitor. Security systems: Security systems aren’t common in rental units, but that may change as technology improves and costs drop for wireless security systems. If you’re operating in a high-crime area or a resident has experienced a break-in, consider working with the resident to explore solutions and perhaps share the costs of added security.